One of the most common orthodontic appliances used in young children is the palatal expander, also known as the RPE. These appliances look intimidating to patients and the thought of having to “do the turns” every day scares a lot of parents. So what can you expect while your child has an expander in their mouth? Arch expansion is one of the most common ways to eliminate crowding and crossbites in growing patients. Successful expansion requires that the growth plate in the roof of the mouth (the midpalatal suture) is not fused. This fusion usually occurs between the ages of 14-16. 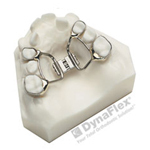 An expander is attached to the upper arch by bands placed around the teeth. Although there are removable expanders, fixed ones have an important advantage in that they cannot be lost or forgotten. While there may be some initial discomfort when an expander is placed just because there has never been anything like that attached to the teeth before, for the most part upper arch expansion is relatively painless. Patients report that they feel pressure on the teeth, in the roof of the mouth, behind the nose, and even between the eyes as their expander is activated. This pressure fades within minutes. Besides pressure, you can also expect your child to speak differently for the first few days. Additionally, you may hear them slurping as their mouth creates extra saliva after expander cementation. We definitely noticed this when Madison had her expander put in! And yes, it's a bit annoying, but it does pass! One of the most visible signs that the suture is opening (the desired effect) is the appearance of a space between the upper central incisors (the 2 front teeth). The space is created as the expander pushes the two halves of the palate in opposite directions. Once you have stopped activating the expander, it is normal for the space to close spontaneously. This occurs as the elastic fibers in the surrounding gum tissues return to their original positions. The underlying bone, however, remains expanded. It is also normal for the front teeth to feel a little loose and get sore as they move back together. To make the first couple of days more bearable for your child as they adapt to their new expander, you may want to find some fun foods for them to eat that don’t require a lot of chewing. Examples include yogurt, pudding, mashed potatoes, ice cream, etc. A day or two after the application, the expander will feel natural in their mouth and normal eating will resume. But food does get stuck in it and excellent tooth brushing and hygiene is essential! Food stuck in the appliance can cause bad breath as well as cavities. Although expanders are more forgiving of hard and sticky foods than are braces, it is recommended that your child avoid any sticky, jelly-like candies that could get stuck in the expansion screw. Because there is always some relapse (movement back towards the original position), your orthodontist may choose to over-expand your child’s palate. He will decide how much expansion is necessary as part of the initial diagnosis and treatment plan. After your orthodontist indicates that you’ve reached your target, he will instruct you on how long the retainer should stay in place to stabilize the results. This is usually 4-6 months, but is determined by each individual case.